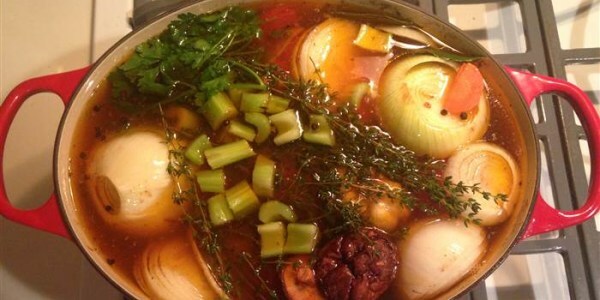 What happens when you try bone broth for a week? The first time I heard the words "bone broth" I wrinkled my nose, scrunched up my face, and thought "What? Ew. Why? What?" I didn't know what it was, just that it sounded a little anatomically graphic and a little gross. (I'm a person who has a hard time eating blood sausage, based solely on the name.) But then I kept hearing about it, again and again, from food bloggers, wellness sites, and overall trendspotters like the ones here at TODAY.com, who answered the critical question back in December: "What the heck is bone broth?" Here's the deal: bone broth is just dressed-up stock. You can make it with any animal bones — beef, chicken, turkey, whatever — which you roast and then simmer with vegetables for hours. It's not exactly a new food (grandmothers have been making it for ages), but those who swear by it say the vitamins and minerals you get from the broken-down bones have powerful healing properties, and can help to alleviate joint and gut pain, boost your immune system, brighten skin and even make your hair shiny. With everyone from The New York Times to chef Tom Colicchio to Al Roker climbing aboard the bone broth train, I decided to try an experiment: I would drink a cup every day for at least a week to see what it was all about, and if I could reap any of its magical health benefits. If Al Roker's already on board, there's no excuse. Here's my diary of how it went. To find out what I can expect, health-wise, I go to dietitian and nutrition expert Bonnie Taub-Dix to get her expert take. "It's not like you swallow it and it knows how to go directly to puff up your cheeks or smooth out your eyelids," she says. "Could it help cellulite? Could it make your hair shiny? If you are otherwise having candy bars in the afternoon and you start drinking bone broth instead, yeah, maybe." I make a note to myself to eat less candy bars. I also swing by Brodo, the bone-broth-only take-out window in New York's East Village, opened in the fall by chef Marco Canora (a small cup of Hearth broth is $4.50, and it goes up from there). Canora tells me he started drinking broth regularly as part of an overall shift toward a healthier lifestyle, after being rough on his body for decades. "It's my version of comfort food," he says. Now at the epicenter of the trend, he says he fully believes in all the purported health benefits, and drinks "tons of it every day." When I tell him he's basically Gwyneth Paltrow, he looks surprised: "I haven't heard that one." I tell him to take it as my highest compliment. "No, it's just the broth." Despite my skepticism, it's so cold outside I can't feel my hands, so as I get up to the window, I start to get really excited about a warm cup of broth. It's a little disconcerting to be served soup in a coffee cup, particularly because as you tip the cup to your mouth, your nose is essentially infused with soup. The sheer meatiness of the smell is off-putting, but as soon as the broth hits my tongue, I'm a believer. "F--- that's good," I say, out loud, to myself. I instantly feel energized to walk the six blocks I need to travel instead of taking the train, just so I can continue to sip my soup against the icy air: making me healthier already! I bring home a massive jar of to-go broth from Brodo to last me a few days, but I just can't get excited about having it on day two. I keep talking about drinking it and putting it off, until finally I get around to microwaving a mug after dinner, almost as a dessert course. The overwhelming smell is a little much, but I add some salt and chug it down. On the way to meet some friends for dinner, I go the BYOBroth route, filling up my thermos with broth and trying not to be weirded out by the fact that my coffee receptacle now smells (maybe permanently?) like soup. The broth is surprisingly delicious, but unfortunately, not such a hit with my dinner companions. "That smells so strong," says one. "That smells like a kennel," says a second friend, who is less diplomatic. "It tastes great!" offers the first. Nobody carries soup around in a thermos to a restaurant," says the second, who is right. In the hallway at work, I strike up a conversation with a near-stranger, who tells me his wife has been drinking bone soup for months following surgery on the recommendation of a health professional, and has "definitely" noticed a difference. Even though it's sitting on my desk, I don't touch my broth today — but nor do I eat my normal afternoon snack of Whatever Is On The Free Table. "I happen to love the placebo effect," Taub-Dix tells me, when I ask if the simple act of adding the soup to my diet could help me make healthier choices. "It might be more of what you're not eating and replacing the soup with than the magical properties of the soup." Maybe the soup works as a weight-loss tool because you don't want to drink it so you just don't eat anything. On the way to a friend's house, someone gets on the subway next to me smelling like McDonald's. Or is that bone soup? They smell very similar. When I take my golden jar of broth out of my bag, my friend's husband says, "That looks like what I made last week... After a rough night on the toilet." Cold broth is the worst broth. I have what feels like the makings of a giant zit under my nose, so I don't know how much stock to put in this whole "makes your skin bright" claim. Chug chug chug. Everyone keeps telling me how easy it is to make, so I buy the surprisingly simple ingredients (onions, carrots, celery, thyme, canned tomatoes, garlic, etc.) on the way home from work, but neglect to read the instructions all the way through. After roasting the bones for half an hour and then simmering them with veggies, I realize around 11 p.m. that the recipe calls for me to leave the pot on the stove for a few hours or overnight to fully simmer. Broth all-nighter! "I'm really proud of myself for making this broth at home," I say to my husband, after waking up to find that I have not burned our house down overnight. "Are you even listening to me?" "I'm sorry, my head is full of too many broth puns," he says. "Take my broth away? Every broth you take? I need to open a Broth IRA account?" I ladle the broth into three giant Tupperware tubs and stick it in the fridge, where Canora promised it will be good for up to a week (you can also freeze it indefinitely). On the way to work, I sip my broth from my thermos for the last time. I can't wait to wash it out and fill it with coffee. Nothing noticeable has changed, except that I have no desire to drink broth ever again. "It's kind of shiny," someone says, when I tell them it was supposed to improve my hair. While I didn't get any tangible benefits, on the plus side, I observed almost no negatives to drinking the broth — and Taub-Dix told me that it likely has no downside unless you're ingesting a lot of added sodium. So if you're someone who likes soup, this is a trend I can definitely recommend. Because guess what? That's what it is. Spoiler alert! The hottest food trend of the year ... is just soup. You're welcome.